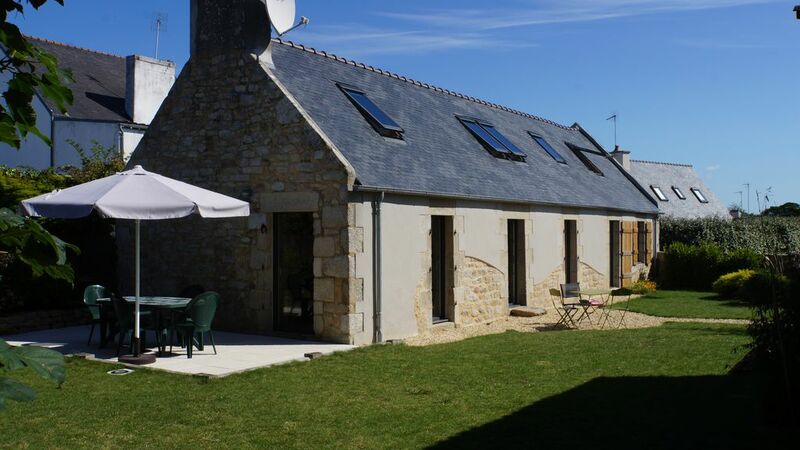 On the Common Cockles, near the beach in Poulluen Larvor (150m), our farmhouse is south facing and can accommodate up to 5 people for family holidays. The terrace, full sun, relaxing is a haven of peace in the garden of 900m2. The house, perfectly situated for exploring the wonders of this beautiful area was renovated in 2012. The interior is spacious and well equipped. At the port of Loctudy, shipment of fish and prawns every day. 5 bikes are available for walks around. Also very close to the village of Lesconil, lively in summer. My husband and I spent two weeks in this very cosy and beautiful house. The garden is huge, with a barbecue and very comfortable deck chairs. In the house there is absolutely everything you need (spices, towels, ...). The beach is very close (100 m) and there are other beautiful beaches not far away: Plage de Lodonnec is about 5-10 minutes by bike (bikes are available in the house, which is very convenient), plage de Sable Blanc is about 5 minutes by car. A hiking trail and a bicycle route pass close by the house, and you can go running along the beach. The house is located in a big and very calm residential area and the neighbours are very friendly. Big supermarkets can be reached in 5-10 minutes by car. There are a lot of things to see and do in the area. Francoise and Didier, the owners of the house, are very nice and helpful. The house is perfect for a couple or a familiy with 2-3 children and we will definetely recommend it to our friends!!! Wir haben 2 Wochen zu zweit im Haus verbracht und hatten sehr schöne Ferien. Es ist ein schönes altes, stilvoll und komplett renoviertes Natursteinhaus mit ausgebautem Dachgeschoss, großzügiger Terrasse und weitläufigem Garten in einer Wohnstraße im Stadtteil Lavor. Das Haus ist perfekt ausgestattet, und wir haben uns sehr wohl gefühlt. Der Hafen von Loctudy ist mit dem Auto ca. 8 Minuten entfernt, der große Badestrand "Sables blancs" ebenso. Ein kleinerer Badestrand ist fußläufig erreichbar. Die Lage ist ideal, um die Region zu erkunden. Die privaten Vermieter sind sehr nett und hilfsbereit, die Abwicklung war einwandfrei. Rénovée avec beaucoup de goût, nos 3 semaines ont été un vrai régal et remplies de bonheur. Les propriétaires charmants ont tout fait pour que notre séjour chez eux soit réussi. Nos enfants ont pu profiter des espaces et de la proximité de la plage. Nous nous y sommes sentis comme chez nous et nous y retournerons c'est une évidence !